Home > Ask Our Experts > How Can I Stop My Dog Biting? 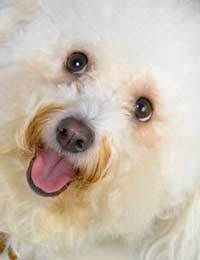 Q.My dog (Bichon Frise) has become a little bit aggressive towards members of the house. Today when I sat next to her and attempted to stroke her, she turned on me and bit me. I am concerned with this as we have many visitors to the house and my fear is her lashing out at someone else or a child! What can I do to perhaps prevent this from happening? Why a dog bites can be different for every dog. To figure out why your pet has taken to biting you’ll need to look for patterns that could point to a cause. To do this, examine your dog, your dog’s environment and the people most often around your dog. To begin with, think about your pet. Is (s)he a puppy or an adult dog? Has (s)he exhibited these behaviours before? If (s)he did, such as when (s)he was a puppy, did you respond positively to nipping or biting because it was cute or playful? Is there a particular time or place in which your dog bites more often than others? Is your dog displaying other aggressive behaviours such as growling, barking or scratching as well as the biting? Next, think about your dog’s environment. Is it suitable for his or her size and energy levels? Does (s)he seem bored in the environment? Is (s)he left alone a lot of the time? Finally, consider the people most often around your dog. Is there anyone in particular that is being bitten? Is there something that everyone is doing that is resulting in the biting? When you have answers to these questions you may be able to pinpoint the cause of the biting. Eliminating this cause, or at least alleviating it, may end the biting. You may not find a ready cause though, so consulting a veterinarian about this behaviour may also be in order. However, eliminating a cause may only go so far to stop the biting. You’ll also need to train your dog that biting is inappropriate by responding to it consistently. The next time your dog bites you must forcefully respond with “Stop!” “No!” or “No biting!” and stop interacting with the dog until (s)he is back under control. When (s)he is, then again provide him or her with attention and praise for ceasing the biting. Training a dog can be difficult, so if you find that you are unable to carry out consistent training methods then you may want to engage the services of a professional animal trainer. You may want to contact your veterinarian if you decide to investigate animal trainers as veterinarians sometimes hold information on reputable animal trainers in your area. @ruth - it sounds like he needs some training as you seem to be giving him enough exercise. He is only young though and this is a phase that will pass given the right guidance. I have included an article on Obedience Training here which may help. i have a 11 month old staffordshre bull terrior .ive had him 4 weeks .he is walked moning and night for a hour each time ,but when we get back if i sit down he starts barking in my face and trying to nip me .then he lunges at me and scrathes my feet .please help .